Usine-c in Montreal presented the festival 'Temps d'images' on February 21 to March 1st, 2008 . I first saw the dance installation 'Koko Doko' Kubilai Khan Investigations, France, and Et Ludica, Germany. 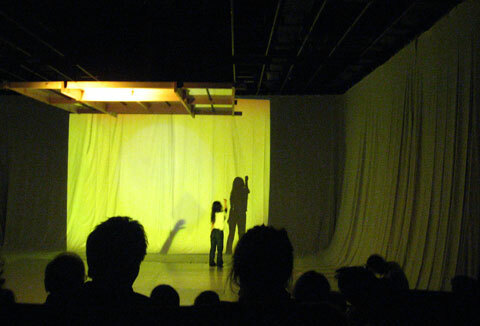 Performers created an interesting play of shadows. Nevertheless, I found that the performers didn't really fit together: A raster man and two Japanese girls. My judgement might be exaggerated, after seeing this phantastic piece by 'FASE' at Usine-c by Belgian choreographer Anne Teresa De Keersmaeker a couple of weeks before. I also expected more when seeing 'L'ange de la Mort' by Jan Fabre from Belgium and Ivana Jozic from Croatia. The set up was interesting: The performer Ivana Jozic was placed on a stage in the middle of the space surrounded by the public sitting on the ground. There were video projections featuring William Forsythe on all of the four walls who was supposed to represent Andy Warhol of whom he was reciting texts. While I enjoyed the first part of the installation with parts of mysterious silence, I found it towards the end somehow repetitive.